Heraclitus once said, “Nothing is permanent but change”. This is especially true in business. Constant adaptation of strategy and processes help us to operate more purposefully while serving our customers more efficiently. That said, while Nelson-Jameson is always open to new ideas and procedures, we certainly don’t subscribe to a mantra of “changing for the sake of change”. When we alter the way we do things, rest-assured that there is a thoughtful reason behind our decision. In this case, the catalyst for change was you. We listened to your feedback, and realized that nelsonjameson.com could use a face-lift. So, we went to work improving our website’s layout and increasing its functionality, while ensuring that its integrity as the virtual source for sanitary processing needs remained intact. Enhanced Search Capabilities Search results are grouped by category, and can be narrowed down within sub-searches so you can find exactly what you need when you need it. 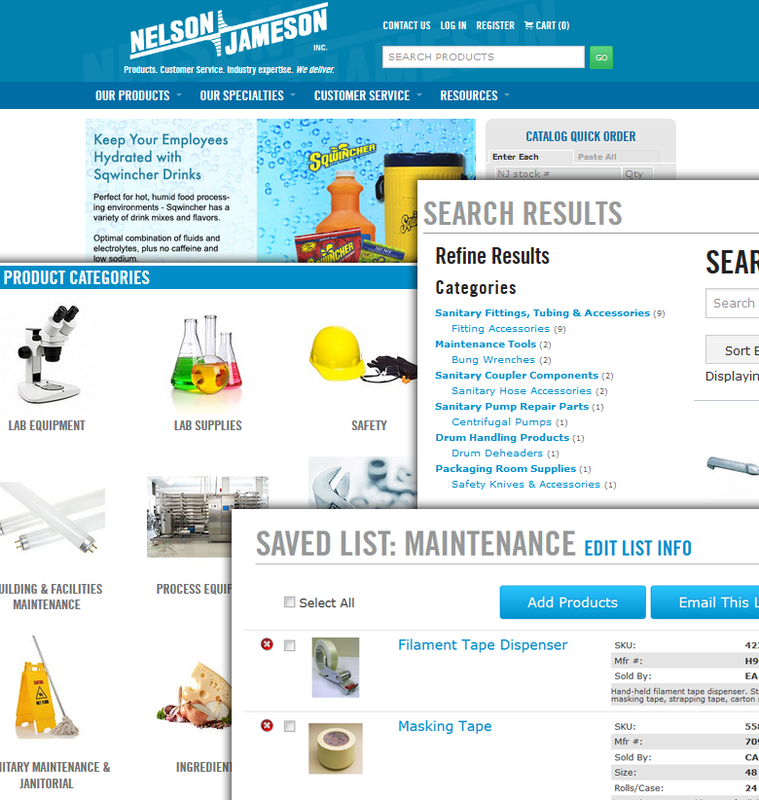 Expanded Categories We’ve doubled the amount of product categories in order to make navigating nelsonjameson.com faster and simpler. Narrower, more-intuitive category navigation makes your job easier. Product Quick View View a product’s basic information in a pop-up box without having to visit the product’s main detail page. Standard/Repeat Order Capabilities Shopping lists can now be made, edited and saved. Lists can be easily added to your shopping cart for quick, repeated and/or ongoing ordering. Shopping List Sharing Easily email any saved shopping list or shopping cart with an optional personalized message. Each product on your shared list will include the price and an image link to that product’s detail page on nelsonjameson.com, so that your recipient will know exactly what you’re purchasing. Quick Order Pad Use the new “Paste All” tab to paste product SKUs and quantities to your Quick Order Pad, and then add them all at once to your shopping cart. Multiple Device Functionality Access nelsonjameson.com from your phone, tablet or laptop without losing functionality. We’re now touchscreen-friendly, too. We kept the wide range of products and customer service that you’ve come to expect, but tried to make your web experience easier with a more user-friendly format, intuitive navigation and increased ordering capabilities. We really like the improvements that we’ve made, and we hope that you do too. Look for the newly-designed nelsonjameson.com to debut soon. As always, let us know what you think. We’re listening. Manager of Web Marketing & Strategic Relationships, Nelson-Jameson, Inc. This entry was posted in General and tagged new website, redesign. Bookmark the permalink. Follow any comments here with the RSS feed for this post. Both comments and trackbacks are currently closed.